Trinity Assembly of God of Olive Branch, Il will be hosting their annual Ladies Retreat on Friday, Sept. 21. The service begins at 7 p.m. with Potluck dinner at 6 p.m. Special speaker is Angie Dean of Tulsa, OK formerly from Mounds, IL. 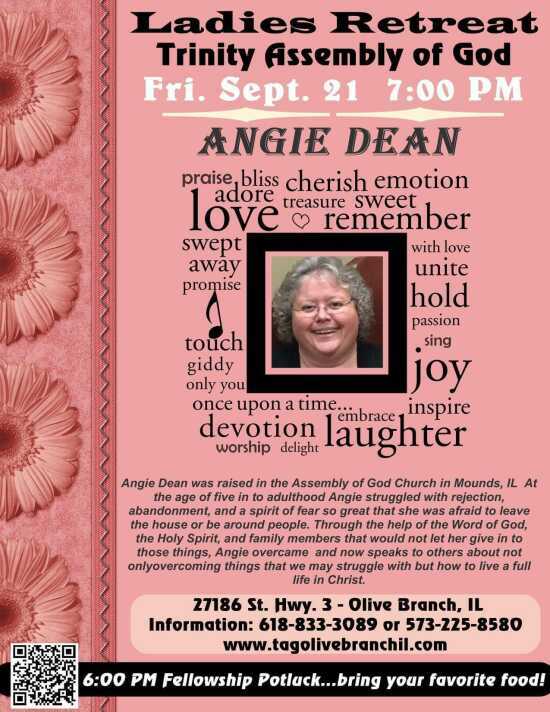 Angie Dean was raised in the Assembly of God Church in Mounds, IL where she served as a Sunday School Teacher and Youth Pastor until she married her husband Steve in 1990. She later served as the head of the women’s ministry and did women’s conferences at the Sandusky Pentecost Church. In 2004, she and her husband heard God direct them to move to Tulsa, OK where they graduated the first year program at Victory Bible Institute and served for seven years in the prayer ministry at Victory Christian Center. From the age of five and in to adulthood Angie struggled with rejection, abandonment, and a spirit of fear so great that she was afraid to leave the house or be around people. Through the help of the Word of God, the Holy Spirit, and family members that would not let her give in to those things, Angie overcame and now speaks to others about not only overcoming things that we may struggle with but how to live a full life in Christ. This will be a special evening of singing and fellowship.